The newfound focus on the conflict in Afghanistan is warranted; the hysteria over the MOAB is not. U.S. Forces in Afghanistan on Thursday dropped a 22,000 lb bomb on ISIS forces in Eastern Afghanistan. 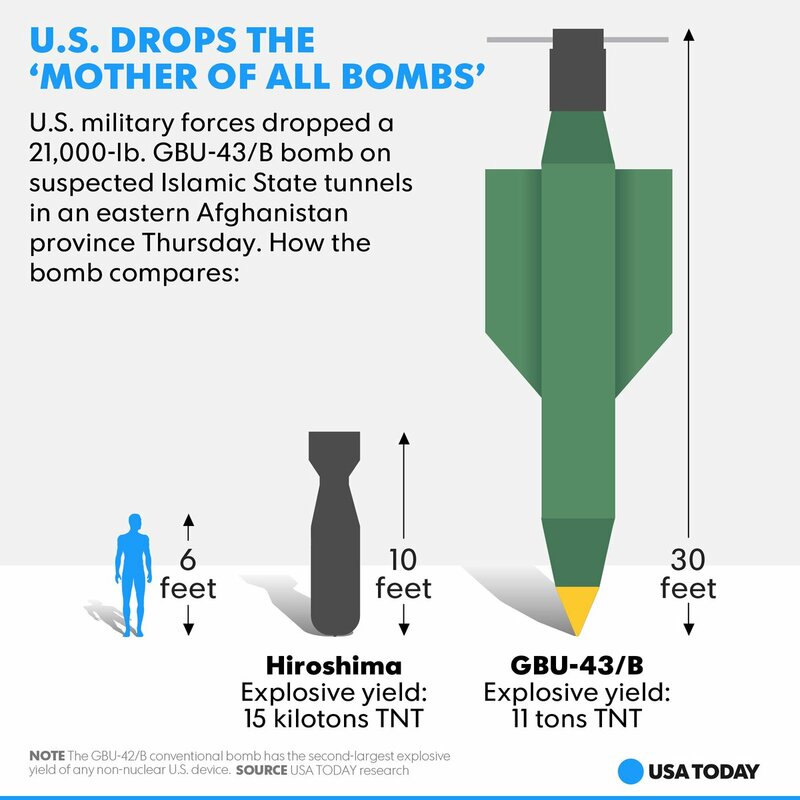 The bomb, the GBU-43 and nicknamed the “Mother of all Bombs,” has the largest explosive yield of any air-dropped conventional weapon in the U.S. arsenal (the ground-penetrating GBU-57 Massive Ordnance Bunker is heavier, but it has a smaller warhead and explosive yield). The mission, according to the U.S. military’s public release, was to disable a network of tunnels and bunkers in the province of Nangarhar, which ISIS forces are using to launch their spring offensive. MOAB’s use has provoked an outpouring of attention on what has seemed a forgotten war. The newfound focus on the conflict in Afghanistan is warranted; the hysteria over the MOAB is not. Despite breathless reports about the U.S.’s use of its “largest non-nuclear bomb” in Afghanistan, there is very little about this weapon, in and of itself, that should give anyone pause. Contrary to some inaccurate (and swiftly deleted) reports about the bombs size, the MOAB is not at all comparable to standard nuclear weapons. The MOAB contains 11 tons of TNT. “Little Boy,” the bomb dropped on Hiroshima, yielded about 15 kilotons of TNT. The United States currently maintains about 94 nuclear bombers capable of delivering the B-61 and the B-83, the latter of which yields up to 1.2 MT of explosive power (that’s megatons, for the uninitiated). Nor is there anything peculiar about MOAB’s means of destruction. Like many conventional weapons, the MOAB’s destructive power comes from blast and fragmentation. The weapon is thermobaric, using surrounding oxygen to create an intense fireball that both extends the blast wave (for MOAB, to about a mile) and radically heats air temperatures surrounding the explosion. While this might sound impressive, the MOAB is only useful against surface targets: it does not have the capacity to penetrate reinforced bunkers and tunnels, for example. MOAB’s target does risk civilian casualties—in 2006, the population of Nangarhar province was over 1.3 million—but the U.S. statement on yesterday’s strike stressed that “U.S. Forces took every precaution to avoid civilian casualties with this strike.” Whether that aim was successful is not yet clear, but here again, this is in line with conventional operations. Some might suggest that MOAB’s importance lies not in its destructive power, but in its symbolic message. Speaking anonymously, a United States Central Command spokesman said that using the MOAB signaled that the U.S. now “means business” in Afghanistan, and can be seen as President Trump fulfilling his campaign promise to “bomb the s—t” out of ISIS. But even these explanations are puzzling. While we might be awed by the size of the weapon, the Obama administration used B52s in Afghanistan to drop three times MOAB’s conventional payload in a single strike. It is not apparent why delivering high explosives in a single package is more significant. Nor should the use of the weapon be seen as a signal towards other states the U.S. sees as threats, such as North Korea and Iran. Because the MOAB is so big, it must be delivered by a relatively slow-moving cargo plane, one vulnerable to basic air defenses. MOAB’s lack of ground-penetrating capabilities means that it is useless against hardened underground targets. Perhaps all of this suggests attention on the strikes in Afghanistan is unwarranted. Not in the slightest. Now that the MOAB has turned the public’s attention to Afghanistan, perhaps we can ask some tough questions about continued U.S. involvement in the conflict. The United States is now entering its seventeenth year of war Afghanistan. It has 8500 troops in the country, split between training Afghan forces and counter-terrorist operations; another 7000 NATO forces are committed to the training mission. Despite these commitments, there has been little, if any, serious discussion of long-term strategic goals or viable political solutions to the conflict. Moreover, while the MOAB is not itself a reason for worry, the larger question of air strikes and their role in counter-insurgency is. In Afghanistan, Iraq, and Yemen the United States has increased the amount of air strikes, often at increased cost to civilians. Although there is no evidence the United States is intentionally violating laws against targeting civilians, even unintended deaths can undercut political goals in counterinsurgency campaigns. Increased air strikes that might destroy targets and protect ground forces in the short term can, in the long-term, undermine strategic aims. In other words, we can stop worrying about the MOAB. We should, however, start worrying about conflicts that have for far too long remained out of the American public’s sight. Stacie E. Goddard is the Jane Bishop '51 Associate Professor of Political Science at Wellesley College. She has been a National Security Fellow at the John M. Olin Institute at Harvard University, a fellow at the Belfer Center for Science and International Affairs at Harvard University, and in residence at the Center for International Studies at Princeton UniversityHer research explores issues of identity, legitimacy, and conflict in world politics. Photo Credit: "Massive Ordinance Air Blast - Weapons - Armaholic," via crypticimages.com.